Mario on the Super Star diving down to Mount Pajamaja. Finishing Bros. is a special move performed by Mario and Giant Luigi as the final attack to defeat a giant boss in Mario & Luigi: Dream Team. When the HP bar of the boss is nearly depleted, it flashes yellow, and the menu only gives the option to use this attack. When it is used, the player must swipe the touch screen to make Giant Luigi leap into space, where he grabs a Super Star. Mario then hops onto the Super Star, followed by Giant Luigi throwing it towards the weakened boss to hit its weak point. 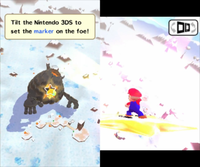 While Mario and the Super Star dives into the boss, the player must tilt the Nintendo 3DS to align the star-shaped cursor with the weak point. Missing the target results an "OK!" attack, small gift drops, and a lower coin reward. A direct hit results in the best final blow with "Excellent!!" hit effect, and the player will receive large gifts. Mario advancing toward Super Bowser. 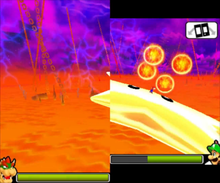 When Bowser (after being made even larger) is pushed into the lava and dazed, a stronger version of this attack called Star Driver can be performed. While the most starts similarly to Finishing Bros., Dreambert appears when Giant Luigi is about to grab the star and grows it to several times its size. The star crosshair is not present for this move. Instead, Mario has to dodge the incoming fireballs that Bowser is shooting by tilting the system. After avoiding all of the fireballs, the star rams directly into Bowser and instantly defeats him. If Mario is hit by one of the fireballs, the move will end in failure and Bowser will jump out from the pool of lava, forcing Giant Luigi to push him back again. If failed multiple times, the player can choose to make the attack easier. Finishing Bros.: Aim with the 3DS! Star Driver: Control the star to attack! During the attack, Mario rides the Super Star in a similar fashion to how Kirby does with a Warp Star. This page was last edited on September 15, 2018, at 16:29.